Let me just say one thing before you read on. I have not written this article it is taken from www.thegreenarrow.co.uk . This is what Britains NHS has become and yet politicians, corrupt and rotten to the core lie about the state of our NHS and our country's finances. This could well be you. The signs are there. I have no words to describe the despicable way our people are being mistreated and abused in their own country, and an article in the Daily Mail today, describing a former land girl "Wallowing in her own filth" in a British NHS Hospital might just about come close to how little we are thought of as a people by the self-serving scum who masquerade as politicians in our country. Former Land Girl honoured by Brown dies after she is left to 'wallow in her own filth' on NHS ward. 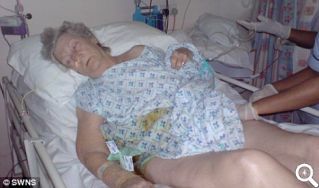 A devastated daughter has accused Gordon Brown of betraying the elderly today after her elderly mother died 'wallowing in filth' in an NHS hospital . Clara Stokes, 84, who was honoured last year by the Prime Minister for her work as a Land Girl during WWII, was left partially paralysed by a massive stroke in December 2009. Her daughter Elle Chambers, 57, claims her mother's subsequent care at Luton and Dunstable Hospital was 'inhumane' and 'not fit for dogs." Whilst our elderly die in their tens of thousands due to being unable to heat their homes because of the Labour governments taxes on fuel and its refusal to denounce the unworkable and repulsive idea that fat rich capitalists should get richer whilst our own people die for reason of their poverty as a result of this and Conservative government policy. It comes closer to some people than others but it is all a matter of time until we find ourselves in similar circumstances. As for this dear lady, you can only pray that you do not end up like her, or you can make a decision to do something to prevent it. Left to die in conditions unfit for dogs they say! Dehydrated they say, rather than left to die of thirst! Staff 'overworked' they say, rather than that they couldn't give a toss! If I write anymore, I am likely to be accused of 'taking advantage' of a grave situation rather than highlighting the appalling state of our country and the appalling creeps we call politicians who are responsible. I hasten to add that the nurses union UNISON are supporting this government in its subversive tactics to stop British National Party candidates from raising these and other important issues in debates and hustings around the country, and the British people are needed to stand up now in our defence if they want any chance to change our country back to a caring society again, where the above deplorable and horrible circumstances can never be allowed to happen again. My very sad condolenses are passed on to this poor lady's family and my thoughts are with them and all our people at this time.